Psychic VR Lab Co., Ltd(Head Office:Tokyo Shinjuku, CEO Masahiro Yamaguchi) known as the company that provides the VR creating platform 「 STYLY 」 and HAKUHODO PRODUCT’S INC.(Tokyo Koto, President & CEO:Naohiko Kishi) has agreed to start a joint R&D for “TIMEMACHINE”, the shared space for open innovation R&D for latest technology, such as MR, which is going to be established in March. By but not limited to the activities above, we plan to contribute to the development of MR, and propagate how MR will connect technology with our social life, change our lifestyles, and create new culture for fields such as art, fashion, music, food, architecture, education, and many more. We will also be holding an event to introduce how the future will change by the development of MR technology for the press at “TIMEMACHINE” on 25th of March 2019. For those who are interested, please contact us at the email address below. Note:Please be aware that this event is held on a first-come, first-served basis. 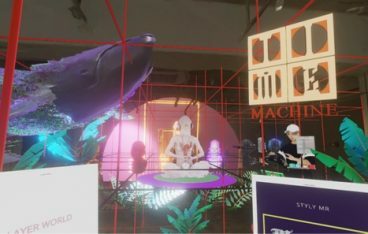 VR Psychic Lab develops and provides the VR creative platform “STYLY” where you can create and stream VR scenes with only a web browser, aiming to create a world in where any creator can create VR worlds, and is working to develop a VR interface for the coming VR era, which will affect culture such as art, fashion or even lifestyles. HAKUHODO PRODUCTS is an integrated production company, and supports and solves problems regarding various regions of promotion for client companies. There are many professionals for various fields such as photography, video, planning and production, direct marketing, event promotion, and premium in the business division. You can download the materials used from below. VR content to the whole world. Let's create an account first.